Legato is a 17 storey high-rise condominium in downtown Victoria. The building is a reflection and celebration of West Coast beauty designed with steps joined together by gently curving balconies, southern sun exposure, ocean and mountain views from all units and the use of natural colours and materials. Green features include a high performance building envelope, minimized thermal bridging of balconies, concrete external shear walls to provide thermal mass, a storm-water management system integrated into the rooftop garden and dedicated electric car charging stations. Maddison is a four storey condominium building offering 18 residences and four penthouses. The building features traditionally inspired architecture with an articulated brick and stucco façade, classical detailed landscaping and triple-pane windows. The building is targeting Built Green Silver designation. 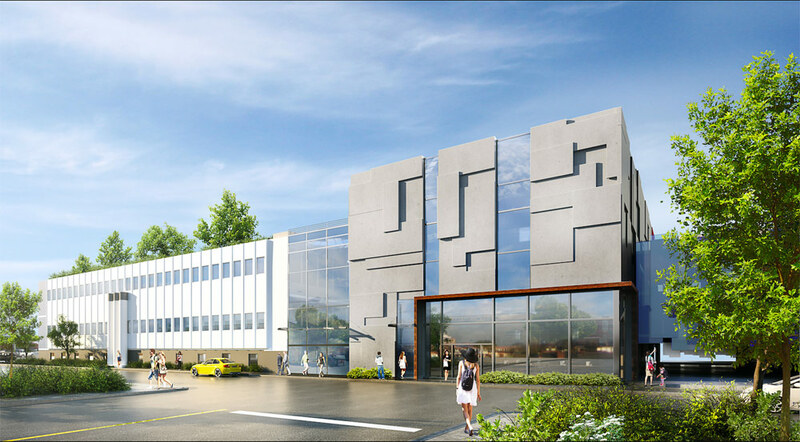 After a successful development in Nanaimo, BCAA looked at Victoria for their next Auto Service Centre location. Situated on Bay Street, the building’s sharp looking design is based around the same concept as its Nanaimo counterpart. The team involved rose to the challenge of fitting the required program efficiently on a compact site. The City's community planning and development committee supported a rezoning application to allow for a 24-storey, 109-unit residential condo project at 65 and 77 Chapel St. at a meeting last week. It is a grey Tuesday morning and Michael Cronquist, project manager for Lyra Residences Limited Partnerships, bounces up a set of concrete stairs. He passes workers wearing hardhats and steel-toed boots. Classic rock echoes through the staircases as workers hammer, nail and scrap away. As he reaches the penthouse, he steps through unfinished rooms onto a south facing terrace. Saanich’s Swan Lake, residential areas, Downtown Victoria and the Olympic Mountains unfold before him. The Sooke Mountains appear to the right, while Mount Tolmie rises off centre to the left, while full turn to the left reveals Mount Douglas and Mount Baker. But perhaps the most surprising view appears off the penthouse’s western terrace — the Saanich Inlet. “Some of the views from the top floors are some of the best in the city,” said Cronquist earlier. No kidding. But the views are only one reason that distinguish Lyra Residences. Other factors include its concrete construction and its location. It offers access to a lot of parks and trails, said Cronquist. Swan Lake is within walking distance, and Christmas Hill lies just north of the development. 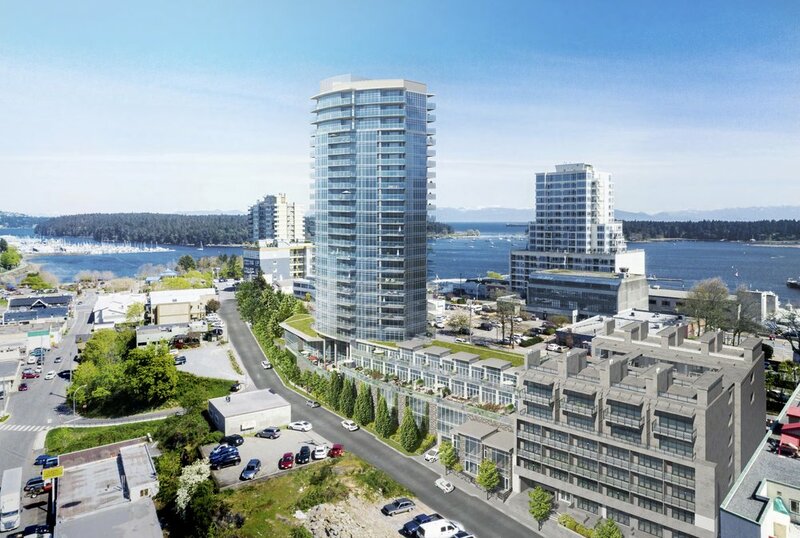 In fact, Lyra Residences lies at the base of Christmas Hill, recessed off McKenzie Avenue. These natural elements are among the selling points to younger buyers, who are looking for that environmental element, said Cronquist. For older buyers, the attraction lies in its geographic proximity to pretty much everything: shops, stores, and various features around the region. It lies 20 minutes from the Legislative Assembly, and 26 minutes from Swartz Bay’s ferry terminal. Lyra Residences actually consist out of two phases, both eight storeys tall. Saanich council first approved the project in 2009 and the first phase of 39 units will be ready by September, with 32 units sold. The second phase with 38 units under construction now has a completion date for June 2019. As of this writing, 19 units have sold. Saanich had initially approved Lyra’s two mid-rise buildings as the third phase of a project by Aplomado Developments, which constructed 12 single family custom homes followed by 27 hillside townhouses. But the condos were delayed. Aplomado regrouped and partnered with Marker Group to create Lyra Residences. Well known Victoria architectural firm de Hoog and Kierulf joined the project to maximize local understanding of the geography. The views speak to this success. The house itself is truly a work of art with oversize doors, lofty ceiling and views that could definitely ease the strains of daily living. The entire design was centred around the great room, aiming to capture views of the Georgia Straight and the mainland mountains. Entering the house, you're immediately struck by its openness as light streams in from all directions. The great room has a 14-foot ceiling, while the ceilings in the rest of the house are ten feet. 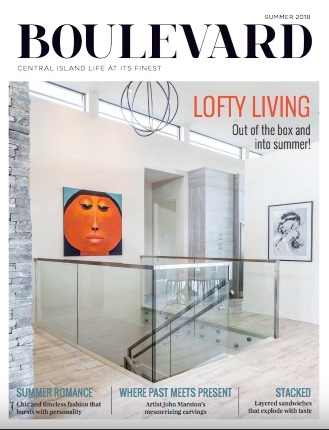 "The owner wanted a lofty living space," said Glen Hill, of de Hoog and Kierfulf Architects. "We achieved that with the high ceilings and a band of windows, which we placed at the top of the walls, just under the roof line. The windows have minimal transition between the roof plane and the actual glass, and the windows themselves have very little detail. The result is lots of natural light and a unique feeling of the roof floating above the walls." In total there are 32 lineal feet of eight-foot-high glass windows with three sliding glass doors that run across the dining/living area and den. Beyond the glass are stunning views of the ocean and coastal mountain range. The home is a prime example of client, architecture and builder collaboration. "It showcases the positive nature of a good team effort and everyone pulling in the same direction," said architect Hill. Perched a scant three metres above the rippled, blue-glazed, yacht scattered waters of Oak Bay, this striking new home makes a sculptural statement with glass, cedar, stone and bold horizontal elements. The owners call it a house of light, because it captures the dawn rays on the ocean side as well as late afternoon glow through a three-storey, glass-walled staircase on the other. The three-level home has five bedrooms, 5 1/2 bathrooms and takes advantage of its spectacular location with 11-foot ceilings on the main and 10-foot upstairs. It is wrapped in glass and gains plenty of passive solar energy. The home is loaded with high-end details, such as transom windows in the great room above a cantilever, cedar soffit that acts as a light shelf. It breaks up the continuous volume of glass above and below, and holds square pot lights for down lighting, LED strip lights for up-glow, and hidden automated blinds. With two laundry rooms, one upstairs and another on the lowest level by the pool, where there is also a large media room with wet bar, microwave, wine fridge, dishwasher and drop ceiling, which hides LED lighting. Architect Peter de Hoog noted it was a complicated project, but a pleasure to work on as the owners had strong, clear ideas about their home’s expression. He had to keep within exterior height limits and also conform to setback requirements regarding sea level rise. The home covers 7,400 square feet, not counting the garage, yet it doesn’t look imposing, because of the strong horizontal elements and exterior overhangs, which provide not only a stylish look, but also shade when the sun is highest in the summer months. We're honoured that McCall Gardens, an 8,000-square-foot funeral facility, has been recognized with the 2018 Saanich Environmental Award in the Business Achievement category. We designed this project with a west coast contemporary aesthetic that visually brings the outdoors in and capitalizes natural light. The uplifting atmosphere connects with nature in a park-like setting, while remaining sensitive to the natural environment. Trevo McCall, Vice-President of the facility has stated that: "Visitors comment every day about the beauty of the building and landscape." Mature, existing sequoia trees envelop the space and a new rain water system delivers water from the roof and parking lot back into the ground where it is cleaned, filtered and transported to the salmon-bearing creek on the property. Our thanks to the Saanich Environment and Nature Areas Advisory Committee for this award. Developer Merchant House Capital has unveiled artist renderings and new details pertaining to a repurposing of Victoria's Times Colonist Building along the 2600-block of Douglas Street. Dubbed Victoria Press Building, the project will incorporate a restoration of the decades-old office and retail complex into 120,000 square feet of commercial and social space across three levels while 4,000 square feet of "garden" retail spaces will front onto Douglas Street. Plans reveal the building's 9,000 square foot print reel room will be transformed into a brewery or distillery that will also incorporate an elevator to lift patrons to the building's 43,500 square foot open air rooftop patio and restaurant space. Upwards of 25,000 square feet of office space will be situated in a lofted format the developers are calling The Boneyard. The Times Colonist newspaper, according to Editor-In-Chief Dave Obee, will remain as the anchor tenant of the modernized building. 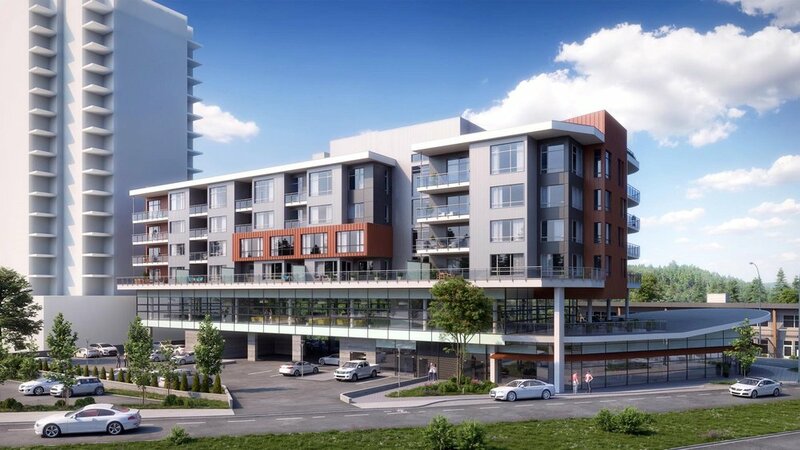 In addition to commercial and office uses, a purpose-built mid-rise rental tower approximately nine-storeys tall will rise above the building's surface parking lot at Kings Road and Ross Lane. The number and type of units have yet to be formally announced by the developer, although multi-level townhomes are expected along the tower's ground floor. The project is designed to provide a “home-like environment” for seniors with complex-care needs and those with dementia, said Esquimalt Mayor Barb Desjardins, vice-chairwoman of the Capital Region Hospital District. Lyra Residences’ location on Rainbow Hill Lane, just below the crest of Christmas Hill in Saanich, is reminiscent of an address from a storybook. But the eight-storey development is very real, with building already underway and completion scheduled for 2018. “You might call Christmas Hill the geographic centre of Greater Victoria. It’s equally distant from most of the areas on the peninsula, so it’s a very central location,” says project architect Peter de Hoog, principal at de Hoog & Kierulf Architects.